So, you've defined your cloud strategy, developed the business plan, published your cloud application roadmap, and got buy-in from all the stakeholders. Now comes the hard part - selecting your cloud service providers and partners! Many companies are finding out the hard way that while the cloud is a simple concept, beneath the billows lays a complex application delivery chain with many hidden dependencies and unforeseen business risks. And with the business demanding faster and faster time-to-value, you have less time to do more, often without good information. 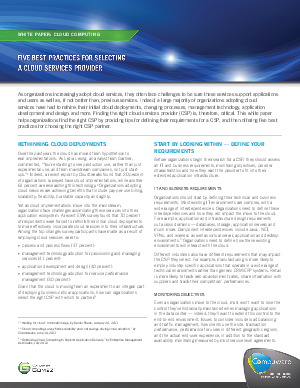 The net result is your risk of choosing the wrong cloud service provider is significant. It could even reduce or eliminate the planned business benefits and ROI.